1ICFO - Institut de Ciències Fotòniques, Barcelona, Spain. 2Niels Bohr Institute and Danish Quantum Optics Center QUANTOP, Copenhagen University, Denmark. Teleportation  is an essential element in quantum information science  and is intimately linked to and enabled by the distribution of entanglement between two locations. The transmission of quantum information is a tricky business, since quantum systems are typically too fragile to be sent directly over large distances. Moreover, the no-cloning theorem  prevents one from realizing a faithful transmission by measuring a quantum state in one location and re-preparing it in another place. Since teleportation provides a possibility to circumvent these problems, it is a key-ingredient in distributed quantum networks and lies at the heart of the practical realization of long distance quantum communication . Apart from that, teleportation allows for universal quantum computing  if supplemented with local operations and suitable entangled resource states. The first experimental realizations of teleportation protocols employed light as the carrier of quantum states . The teleportation between matter systems is more challenging, but also particularly relevant. In contrast to photons, matter systems provide long-lived degrees of freedom which are required for the storage of quantum information. Matter systems are also needed for the efficient processing of quantum states and the extension to large quantum networks which involve multiple remote nodes. The teleportation of quantum systems between matter systems has been demonstrated deterministically between ions that are held in the same trap . However, for macroscopic distances, so far only probabilistic implementations were available, which yield random outcomes and succeed therefore only with a certain probability. In our recent publication , we report on the realization of a novel protocol for teleportation over a macroscopic distance , which allows for the deterministic transfer of a quantum state, i.e. this scheme guarantees the successful teleportation of quantum states in every single attempt. This feature is important for technological applications and also opens up new possibilities for the teleportation of quantum dynamics . The experiment is carried out using two atomic clouds, A and B, at room temperature which are contained in glass cells that are placed 0.5 meter apart . Each atomic cloud contains approximately 1012 Cesium atoms and the quantum state of each of these samples is encoded in the collective atomic spin state of the atomic cloud. A freely propagating laser field is used to entangle the two atomic samples and to teleport the spin state of cloud B to cloud A. Figure 1: Deterministic quantum teleportation between two atomic clouds. A laser field is used to entangle the two samples and to teleport the spin state of cloud B to cloud A. More specifically, the interaction between the laser field and a gas sample leads to entanglement between the atoms and the light. 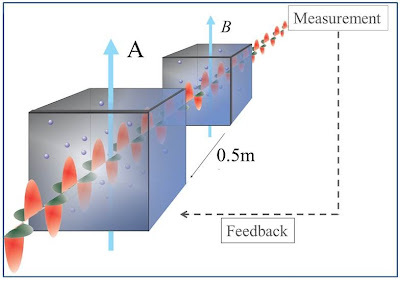 In our teleportation protocol, the laser field passes both samples, A and B, and is afterwards measured. This procedure first creates entanglement between the sample A and the light. The light then passes through the sample B and gets an imprint of its quantum state. The teleportation scheme is completed by performing a conditional feedback operation on cloud A: the spin state of sample A is displaced according to the measurement outcome using magnetic fields that are applied to the container of cloud A. We used the deterministic character of the teleportation scheme to realize a “stroboscopic” teleportation, in which a sequence of rapidly changing spins states has been teleported between the two gas samples. This approach can be further extended to achieve a truly time-continuous teleportation, which paves the way toward the teleportation of quantum dynamics and the simulation of interactions between distant objects which cannot interact directly . This work was done in collaboration with H. Krauter, D. Salart, J. M. Petersen, and H. Shen at the Niels Bohr Institute, Copenhagen, Denmark and T. Fernholz at the University of Nottingham, UK. Charles H. Bennett, Gilles Brassard, Claude Crépeau, Richard Jozsa, Asher Peres, and William K. Wootters, "Teleporting an unknown quantum state via dual classical and Einstein-Podolsky-Rosen channels", Physical Review Letters, 70, 1895 (1993). Abstract. Michael A. Nielsen, Isaac L. Chuang, "Quantum Computation and Quantum Information". Cambridge University Press, Cambridge (2000). W.K. Wootters and W.H. Zurek, "A single quantum cannot be cloned", Nature, 299, 802 (1982). Abstract. H. J. Kimble, "The Quantum Internet", Nature, 453, 1023 (2008). Abstract. Daniel Gottesman and Isaac L. Chuang, "Demonstrating the viability of universal quantum computation using teleportation and single-qubit operations", Nature, 402, 390 (1999). Abstract. Dik Bouwmeester, Jian-Wei Pan, Klaus Mattle, Manfred Eibl, Harald Weinfurter & Anton Zeilinger, "Experimental quantum teleportation", Nature, 390, 575 (1997). Abstract; A. Furusawa, J. L. Sørensen, S. L. Braunstein, C. A. Fuchs, H. J. Kimble, E. S. Polzik, "Unconditional Quantum Teleportation", Science 282, 706 (1998). Abstract. M. Riebe, H. Häffner, C.F. Roos, W. Hänsel, J. Benhelm, G.P.T. Lancaster, T.W. Körber, C. Becher, F. Schmidt-Kaler, D.F.V. James, R. Blatt, "Deterministic quantum teleportation with atoms", Nature 429, 734 (2004). Abstract M. D. Barrett, J. Chiaverini, T. Schaetz, J. Britton, W. M. Itano, J. D. Jost, E. Knill, C. Langer, D. Leibfried, R. Ozeri, D. J. Wineland, "Deterministic quantum teleportation of atomic qubits", Nature 429, 737 (2004). Abstract ; M Riebe, M Chwalla, J Benhelm, H Häffner, W Hänsel, C F Roos and R Blatt, "Quantum teleportation with atoms: quantum process tomography", New Journal of Physics, 9, 211 (2007). Abstract. H. Krauter, D. Salart, C. A. Muschik, J. M. Petersen, Heng Shen, T. Fernholz, and E. S. Polzik, "Deterministic quantum teleportation between distant atomic objects", Nature Physics, 9, 400 (2013). Abstract. Christine A. Muschik, "Quantum information processing with atoms and photons". Ph.D. thesis, Max-Planck Institute for Quantumoptics (2011). PDF file. 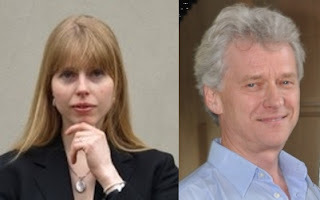 Christine A. Muschik, Klemens Hammerer, Eugene S. Polzik, and Ignacio J. Cirac, "Quantum Teleportation of Dynamics and Effective Interactions between Remote Systems", Physical Review Letters, 111, 020501 (2013). Abstract. Klemens Hammerer, Anders S. SØrensen, and Eugene S. Polzik, "Quantum interface between light and atomic ensembles", Review of Modern Physics, 82, 1041 (2010). Abstract.